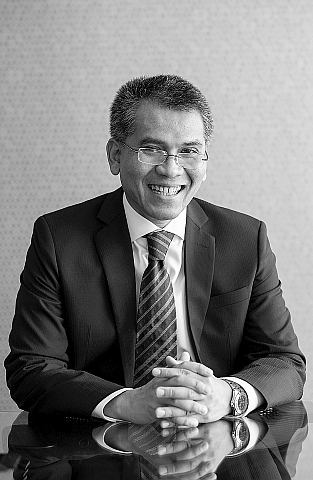 Ahlan resumed practice by joining Kadir Andri & Partners as a partner in June 2015 after five years in an in-house role as Director, Legal in Danajamin Nasional Berhad, the financial guarantee insurer. Prior to Danajamin, Ahlan has been in active practice in Malaysian law firms since 1997, including as a partner at Zaid Ibrahim & Co immediately before joining Danajamin. Ahlan brings with him a combination of experience both in legal practice and corporations, having started his career in Shell Malaysia in 1991 following his graduation. His previous work in legal practice focuses on corporate and commercial matters, including mergers and acquisitions, equity capital market, securities and general corporate advisory and transactional matters, mainly for listed organizations. He also has experience in general banking and debt capital market work. While in Danajamin, he was a member of the initial team which had put in place the entire legal framework for the organization and the guarantee products. Advised Khazanah in taking private UDA Holdings Berhad via selective capital reduction & repayment (“SCR”), the first take private of a listed entity by SCR in Malaysia. Advised Malaysia Airline Systems Berhad in its rationalization of domestic air routes with Air Asia Berhad. Advised Linde AG, Germany in taking private Malaysian Oxygen Berhad via acquisition and Mandatory General Offer under the Take-over Code including compulsory acquisition of remaining minorities. Advised Underwriters and JLMs in Maybank Berhad’s RM6 billion rights issue, one of the largest rights issue in Malaysia. Advised KPJ Healthcare Berhad, Kulim (Malaysia) Berhad and Johor Land Berhad on its respective corporate reorganization each involving the acquisition of companies/assets from its major shareholder, Johor Corporation. Advised Pos Services Holdings Berhad in its capital repayment and restructuring involving transfer of its listing status to its then wholly-owned subsidiary, Pos Malaysia Berhad. Advised in respect of Media Prima Berhad’s issue of exchangeable bonds ie exchangeable into existing shares of its associated company, The New Straits Time Press Malaysia Berhad (“NSTP”).